Every time I turn around, my boyfriend, Chris, seems to be chomping on something or another…but he must have the metabolism of a gerbil…because the boy never gains a pound, and is the skinniest boy alive I think. Amazingly though, with all his eating, he is not really all that into food. In fact, he is down right food apathetic. He eats to survive…because his body requires it. Dinner time is matter of fact…it doesn’t matter to him whether he is eating a peanut butter sandwich or a chicken dinner I’ve spent the entire day cooking…which is kind of why I haven’t really cooked for him much during our year of dating. It seems a waste of time and energy, to prepare something amazing, when the boy could be just as happy eating a frozen pizza. (hee). Which means, we tend to eat out. A lot. (Too much). We have our old standbys…(El Nibble Nook…Siam Spicy…etc)…but once in a while, I get him to bust out and try something new with me. The other evening, we went to a little restaurant just a few miles from his house. It’s in a little strip mall in West Bloomfield, tucked away. Chris ordered the old standby of General Tso’s Chicken. It was the crispiest coated chicken ever, (just how I like it), with a juicy tender morsel of chicken inside. It was coated with a sweet (but not too sweet) sauce, with just the right amount of seasoning and heat, and a side of broccoli. It wasn’t too saucy, so you could actually taste the chicken…and not drown in the sauce. We also enjoyed salads with Wasabi dressing. A little spicy for my taste…but very good if you like it hot. The dessert was disappointing. We had the chocolate lava cake, which was a luke-warm gooey mess. More like chocolate pudding, instead of a cake with a molten center. 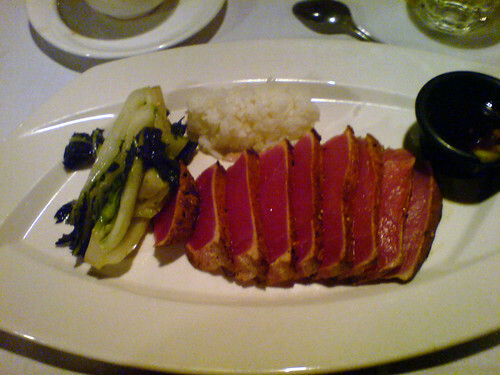 Not the best of endings, but that tuna was so good, I can easily overlook the dessert. I’ll definitely be going back to the Eurasian Grill very soon, and bringing all my foodie friends to enjoy it with me!